Rediff.com » Movies » How fans remember Rajkumar! April 24 is an important day for the Kannada film industry because it happens to be late 'Karnataka Kulatilaka' Rajkumar's birthday. Kushala, a fan had agreed to marry Shivakumar, now her husband of 29 years, only after he promised to take her to every Rajkumar film. There are also bureaucrats who gave up their prestigious jobs to take to agriculture after watching Bangarada Manushya. In Bhakta Prahalada the actor hits his mace against a pillar. The scene just coincided with the collapse of an under construction book shop situated near the theatre where the screening was taking place. People started attributing the fall of the structure to the impact of the mace that Rajkumar had wielded. Such was the power of the actor, they believed. Sampatige Sawal, one of his most popular films has a story attached to it too. In the song Yaare kugadali, ure horadali, yemme ninange saati illa... the 'Varanata' was picturised sitting on a buffalo. It is said that the owner of the buffalo cashed in on the Rajkumar factor and sold the buffalo for Rs 3500, which he had bought for only Rs 350. The unit had to look for another buffalo to complete the shoot. Years ago a security guard in Chennai airport on spotting Rajkumar in an all white outfit commented, "Sir, you really look good when dressed in white..."
It was this remark that is said to have prompted the actor to sport a white shirt and panche (dhoti) off screen throughout his life. Recalls Chandru, the man who stitched these shirts and the trend setting suits for annavru (as the actor was known as he was treated like an elder brother by his fans and the film fraternity), "I met annavru for the first time when I was ten-years-old. I used to visit him in Chennai along with Yamnath, who used to be the actor's tailor then. "It is his affection towards me that made me visit him often. As years passed by, I took tailoring as my profession and ever since I have been stitching clothes for annavru and his family. "I am their mane (house) tailor. The last suit I stitched for him was for Shabdavedhi. He wore it in the song Prema Kashmira...He told me that Kashmiri women had complemented him on his looks and also said that the suit had made him look years younger. They thought him to be around 40 years of age when in fact he was actually 70 plus! "Post his death also, I'm doing a lot of business thanks to him, as people come and ask me to stitch suits like his. The one he wore in Eradu Kanasu is popular among grooms. Also a city college had 500 suits made last year in the same style." "My association with Rajkumar started during the filming of Dhruvathare. I remember him as a simple person and a dedicated actor. In Kavirathna Kalidasa, there was a scene where Rajkumar was supposed to touch the feet of Goddess Kali. "Nalini, who played the role of Kali came to Rajkumar and said that it was embarrassing to have a senior actor like him touch her feet. All that Rajkumar said was, "Here, you are the God and I, your devotee. We have to play our parts, don't worry about it!" Another example of Rajkumar's dedication is the fact that he stayed away from non-vegetarian food whenever he was shooting for mythological films. He also had immense respect for his female co-stars and was against indecent exposure. "Rajkumar also had the habit of watching his films with the audience. He usually went to Prassana or Sagar theatre (in Bangalore) and judged his performances depending on people's reactions. Whenever people came and complemented him on his movies, he would ask them if they had watched Manthralaya Mahatme and Kasturi Nivasa, the two films that were close to his heart. "Also, another lesser known fact about him is that he, before putting on the grease paint for any movie, he would to go to Tirupathi. If he encountered trouble during the pilgrimage, he would reconsider doing that particular project." Speaking of the actor's food habits and favourite film stars, Harish says, "He was also fond of Iyangari cuisine. And I being an Iyangari used to take Sakre Pongal and kosambri during Gokulashtmi festival. He also loved my mother's home made pickles and said that her pickles made him eat four extra dosas! " Rajkumar, he also says, was a very good judge of people. "He never raised his voice and if anyone was rude to you in front of him he would pacify you by saying that God would take care of them." The pain was immense for Chenna when his finger got jammed in a door while trying to stop a mob from entering a room in which Rajkumar was sitting. The pain however was totally worth it for the fan as it paved way for a life-long relationship with his idol. Chenna who was Rajkumar's personal assistant and junior artist in almost all his films throws more light on the person behind the personality. "I first met him on the sets of Babruvahana in Chamundeshwari Studio. I was a junior artist and went down to the dining area to see what he eats. I was stopped by crew members but noticing me, Rajkumar called out and spoke to me. His generosity floored me and I became an even bigger fan of his. "Shankar Nag gave me an opportunity to share screen space with Rajkumar in Ondu Muttina Kathe. I am the one who slaughters a lamb in the marriage scene. I was also required to carry him on my shoulders in that scene. After the shot was approved, I refused to put him down. He asked if he wasn't too heavy and I said that he was as light as a feather. He laughed so much at my comment. "Our relationship nurtured with each film. But the door slamming incident brought us closer. He took me as his assistant from then on. "Rajkumar was a very kind man. He never spoke ill of anyone. 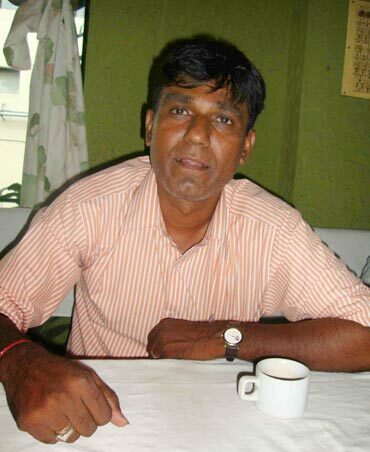 He didn't have a bad thing to say even about forest brigand Veerappan, who kidnapped him. In fact he chose to remember the tasty upma and rasam that he was served when he was held hostage. "Speaking of food, I am reminded of another incident that took place in Delhi. Sir loved biryani and wanted me to find out where one should go to get the best mutton biryani. We went to Karol Bagh and had biryani. He even had a cone ice cream and beeda (like paan). He was a man of simple pleasures. "Rajkumar was also very humble. He treated everyone equally. If he checks into a big hotel, we also were booked in the same hotel. We were even flown the same class as his in flights. He treated people who worked with him like family. The void created after his death can never be filled. "Our last conversation is still etched in my mind. He sat me down by his side, planted two kisses on my cheeks, gave me a hug and told me that God would take care of me and that things would go my way as I was good man. He wanted to move back to his village and had asked me if I would shift with him. Since I wanted to be with him and dedicate myself to him, I didn't even get married. I miss him." Last year it was a Rajkumar statue made of cake. This year it's going to be one made of sandalwood soap to mark the day for Suresh Babu, a Rajkumar fan, who comes up with unique ideas every year to pay tribute to his idol on the occasion of his birth anniversary. 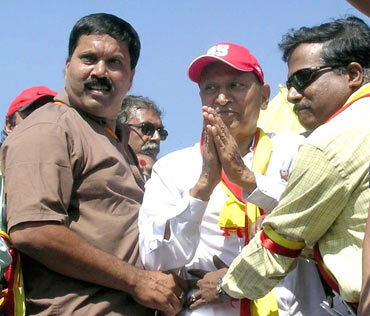 "I have been holding programmes to commemorate annavaru's birthday for the past four years. 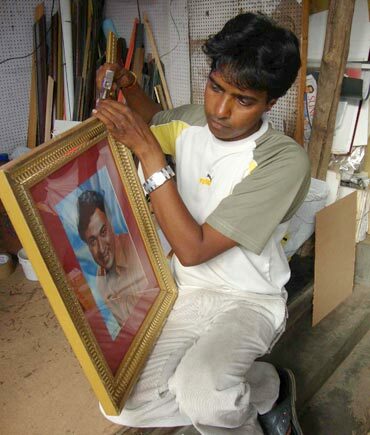 While in the first two years, I held photo exhibitions of Rajkumar, in the third year I had a lifesize statue of him built out of chocolate cake. The initiative cost me over one lakh rupees. "This year, there are no budget constraints. My friends and I are getting together and making a statue out of soap. It will be modelled on the basis of Rajkumar's character in SriKrishnadevaraya. Over 250 cakes of soap are being used by Hema and Raju to design this statue. We are looking for a place to store the statue post our programme." 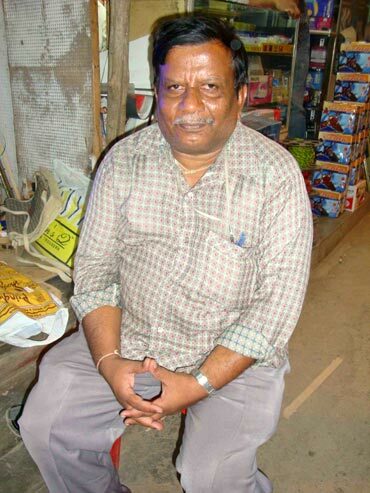 Babu also owns a shop where he sells Rajkumar's photographs. They are priced anywhere between Rs 250 to Rs 10,000. The costliest one is a Rajasthani painting of the thespian. Actor Puneet who is writing a book on his father Rajkumar is said to have accessed several photographs from Babu's collection. "Also there is a great demand for annavru's photograph among women. 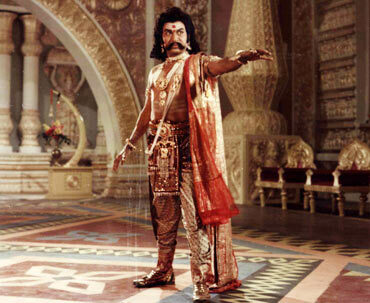 Many people come asking for a still from Thayi Devaru with Rajamma and Rajkumar in it." Babu also has original stills from Kasthuri Nivasa, Lagna Patrike and Eradu Kanasu. "Apart from collecting photographs, I love collecting trivia about Rajkumar." Rajkumar had stopped signing movies after Parashurama as he wasn't getting good scripts. 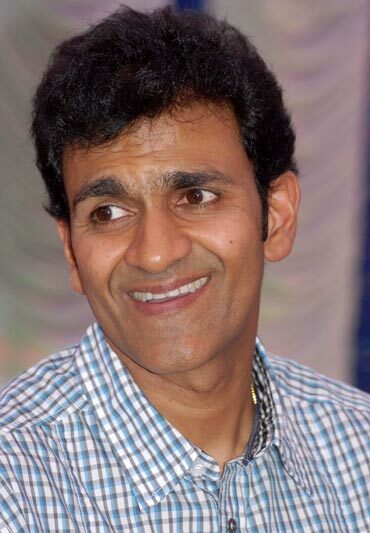 But an incident on his birthday involving a fan prompted him to get back to acting and that too with a strong script remembers Raghavendra Rajkumar. "My father always maintained that he was not great enough for his birthdays to be celebrated on a large scale. All the same, he never disappointed fans who came to wish him on his birthdays. "On one such occasion, he went up to the gate to greet fans and one person started crying. When asked why, he said that he was sad as Appaji (father) had stopped acting. He wouldn't stop crying until my father said that he would do a film by his next birthday. He then came in and straight away went to the pooja room and prayed to God to give him a good script. Soon after Jeevanachaitra happened." The other birthday incident that touched Rajkumar was when the entire family presented him with a family photograph.